What did Ezekiel see when he saw the wheel within the wheel? Was he an eyewitness to a UFO event? What secrets does his vision reveal and how does it relate to UFO and alien phenomena? When I was doing the research on the chapter Ezekiel’s Wheels and UFOs in my book, Alien Antichrist, I was actually very surprised by what I uncovered in the Bible. I did not realize that what Ezekiel saw in the chariot vision of the Merkabah actually reveals some of the secrets of UFOs and also explains why there are UFOs in the first place! Let me explain, but first, lets read a passage from Ezekiel to put the discussion in its proper perspective. And I looked, and, behold, a whirlwind came out of the north, a great cloud, and a fire infolding itself, and a brightness was about it, and out of the midst thereof as the colour of amber, out of the midst of the fire. Also out of the midst thereof came the likeness of four living creatures. And this was their appearance; they had the likeness of a man. And every one had four faces, and every one had four wings. And their feet were straight feet; and the sole of their feet was like the sole of a calf’s foot: and they sparkled like the colour of burnished brass. And they had the hands of a man under their wings on their four sides; and they four had their faces and their wings. Their wings were joined one to another; they turned not when they went; they went every one straight forward. As for the likeness of their faces, they four had the face of a man, and the face of a lion, on the right side: and they four had the face of an ox on the left side; they four also had the face of an eagle. Thus were their faces: and their wings were stretched upward; two wings of every one were joined one to another, and two covered their bodies. And they went every one straight forward: whither the spirit was to go, they went; and they turned not when they went. As for the likeness of the living creatures, their appearance was like burning coals of fire, and like the appearance of lamps: it went up and down among the living creatures; and the fire was bright, and out of the fire went forth lightning. And the living creatures ran and returned as the appearance of a flash of lightning (Ezekiel 1:4-14). Next the prophet describes the wheels that accompany the cherubim. Now as I beheld the living creatures, behold one wheel upon the earth by the living creatures, with his four faces. The appearance of the wheels and their work was like unto the colour of a beryl: and they four had one likeness: and their appearance and their work was as it were a wheel in the middle of a wheel. When they went, they went upon their four sides: and they turned not when they went. As for their rings, they were so high that they were dreadful; and their rings were full of eyes round about them four. And when the living creatures went, the wheels went by them: and when the living creatures were lifted up from the earth, the wheels were lifted up. Whithersoever the spirit was to go, they went, thither was their spirit to go; and the wheels were lifted up over against them: for the spirit of the living creature was in the wheels. When those went, these went; and when those stood, these stood; and when those were lifted up from the earth, the wheels were lifted up over against them: for the spirit of the living creature was in the wheels (Ezekiel 1:15-21). Here Ezekiel describes the wheels and rings which accompany the cherubim. Last, he describes the LORD sitting on His Throne. And the likeness of the firmament upon the heads of the living creature was as the colour of the terrible crystal, stretched forth over their heads above. And under the firmament were their wings straight, the one toward the other: every one had two, which covered on this side, and every one had two, which covered on that side, their bodies. And when they went, I heard the noise of their wings, like the noise of great waters, as the voice of the Almighty, the voice of speech, as the noise of an host: when they stood, they let down their wings. And there was a voice from the firmament that was over their heads, when they stood, and had let down their wings. And above the firmament that was over their heads was the likeness of a throne, as the appearance of a sapphire stone: and upon the likeness of the throne was the likeness as the appearance of a man above upon it. And I saw as the colour of amber, as the appearance of fire round about within it, from the appearance of his loins even upward, and from the appearance of his loins even downward, I saw as it were the appearance of fire, and it had brightness round about. As the appearance of the bow that is in the cloud in the day of rain, so was the appearance of the brightness round about. This was the appearance of the likeness of the glory of the LORD. And when I saw it, I fell upon my face, and I heard a voice of one that spake (Ezekiel 1:22-28). I realize that this is a long passage of Scripture, however, before I begin to explain the words that relate to the UFO and alien phenomena, I had to put it all in its proper perspective. Truly the vision was of the Lord God, and Ezekiel tells us exactly what he saw at the beginning of the chapter: “Now it came to pass in the thirtieth year, in the fourth month, in the fifth day of the month, as I was among the captives by the river of Chebar, that the heavens were opened, and I saw visions of God” (Ezekiel 1:1). That Ezekiel saw a vision of God is clearly stated, not UFOs or aliens as the Ancient Alien theorists like to state ad nauseam. As I said before, the vision was provided to Israel to correct their sinful wayward ways, and to provide comfort so that they would know that God had not abandoned them in Babylon, and that all was not lost. God is sovereign, and He still rules over Israel and the affairs of men from His Merkabah, or war chariot. With all of that said, lets look at a few of the words the prophet used and see how they may apply to the UFO phenomenon that we see today. The following excerpts are taken from my book, Alien Antichrist, The Terrifying Truth about UFOs and Aliens, Antichrist, and the End of Days, copyright 2014©Jeffrey A Wingo, pages 163-164. 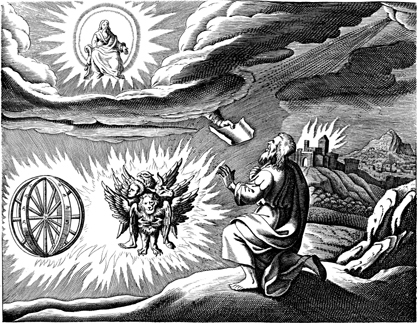 In my next post I will discuss a few more Hebrew words as they relate to the wheels and the rings that Ezekiel saw. I think you will find that discussion just as fascinating. If you would like to learn more about UFOs and aliens and how they relate to the last days as then consider getting a copy of my book, Alien Antichrist, The Terrifying Truth about UFOs and Aliens, Antichrist, and the End of Days. In the book I explain how UFOs and aliens will be used by both men and Satan to lead the world into the arms of the final dictator of planet Earth, the Antichrist. 2. Strong’s H2416 – chay; living, alive;living thing. 3. Strong’s H3742 – kĕruwb; Gesenius’ Hebrew-Chaldee Lexicon. 4. Jeff Wingo, Alien Antichrist, The Terrifying Truth about UFOs and Aliens, Antichrist, and the End of Days (Create Space, 2014); page 163. 6. Alien Antichrist, op. cit. ; See also the Pulpit Commentary on Ez. 1:4. (1890). 8. Strong’s G3788; See also Thayer’s comments on this word. Jesus said the eye is the light of the body. 9. Strong’s H2830; See also Gesenius on the word chashmal. As most of you know the other day ISIS Islamic terrorists beheaded 21 Egyptian Coptic Christians. As if this atrocity is not enough, they also burned to death over 40 people in the country of Iraq. 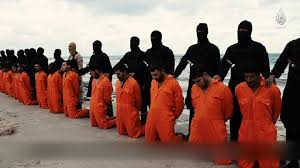 President Obama refuses, even now, to acknowledge that these men who were brutality murdered were Christians. He also refuses to acknowledge the origin of this threat as Islamic Terrorism. He said at a summit the other day that this is not Islam–THAT IS A LIE, AS IS EVERYTHING ELSE WITH THIS PRESIDENT! The ISIS terrorists killed these poor men because they were Christians–not just Egyptians–MR. PRESIDENT–THE ISLAMIC TERRORISTS MURDERED CHRISTIANS. Please pray for the persecuted church. They need our prayers and they need hope. As you saw, they realized their final hope was in the person of the Living Savior, Jesus Christ. During the Tribulation a great multitude of slaughtered Christians will stand before the Lamb and sing a new song, the Song of the Lamb. After this I beheld, and, lo, a great multitude, which no man could number, of all nations, and kindreds, and people, and tongues, stood before the throne, and before the Lamb, clothed with white robes, and palms in their hands; And cried with a loud voice, saying, Salvation to our God which sitteth upon the throne, and unto the Lamb. And all the angels stood round about the throne, and about the elders and the four beasts, and fell before the throne on their faces, and worshipped God, Saying, Amen: Blessing, and glory, and wisdom, and thanksgiving, and honour, and power, and might, be unto our God for ever and ever. Amen. And one of the elders answered, saying unto me, What are these which are arrayed in white robes? and whence came they? And I said unto him, Sir, thou knowest. And he said to me, These are they which came out of great tribulation, and have washed their robes, and made them white in the blood of the Lamb. Therefore are they before the throne of God, and serve him day and night in his temple: and he that sitteth on the throne shall dwell among them. They shall hunger no more, neither thirst any more; neither shall the sun light on them, nor any heat. For the Lamb which is in the midst of the throne shall feed them, and shall lead them unto living fountains of waters: and God shall wipe away all tears from their eyes (Revelation 7: 9-17).